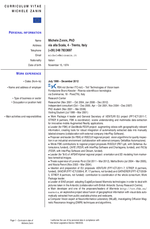 Holding a degree in Computer Science Engineering (2000) and a PhD in ICT (2006), I worked at Fondazione Bruno Kessler FBK, Trento, Italy, Technologies of Vision group, from 1999 to 2012. Initially as visiting student, then as consultant, and finally as full researcher. My research interests cover computer vision theory and some related application fields: augmented reality, geo-informatics, intelligent vehicles, industrial quality control. This page is a brief summary of my professional life. All the details, including a complete list of publications, projects, and previous jobs, are available in the full curriculum vitae (pdf, 289K, last updated on December 6th, 2016). On December, 2012 I decided to end my collaboration with FBK and I took 6 months off to explore the World. I wrote a travel journal about this experience in the A piedi blog (in Italian). Now, Autumn 2013, I am working on short term projects for local companies as freelance ICT consultant. Meanwhile, I am looking for a new job. I would like to keep exploring the same topics that I passionately researched during the last 10+ years, but I am open to employ my skills and initiative in new challenges. I have no geographical constraints. My personal addresses (home, email, social web) are available in the Contact page. Philosophiae Doctor (PhD) in Information and Communication Technologies, 2006. ICT International Doctoral School, University of Trento, Italy. In 2003, visiting student at Massachussets Institute of Technology MIT, Center for Biological and Computational Learning CBCL. Thesis title: Vision-based road recognition and obstacle detection for intelligent vehicles. Laurea degree in Computer Science Engineering, 100/100 e lode. University of Bologna. Thesis title: Tecniche di visione artificiale applicate al controllo del traffico: rilevamento di code e conteggio classificato di veicoli. Other. I attended many specialization courses and summer schools, e.g. La visione delle macchine (2000), University of Modena, Italy. Image and Video Compression (2001), Portland State University, USA. Dynamic Traffic Flow Modelling and Control (2003), Technical University of Crete, Greece. Numerical Geometry on Non-Rigid Shapes (2010), University of Verona, Italy. Marmota project. Automatic extraction and recognition of geographical features embedded into photos and videos, i.e. mountains, villages, and other toponyms. I was the main developer and one of the proposers/leaders of the project. I was also responsible for dissemination: results page and photo-blog. VENTURI EU project (FP7-ICT STREP). Scene understanding and multimedia data extraction for innovative Augmented Reality applications. Since the initial planning of the proposal, I actively contributed to project definition, partner coordination, and research activities. Until the end of 2012, I was also WP leader and General Secretary. TRAVEL projects. Computer vision applications to Intelligent Transportation Systems and Intelligent Vehicles. I worked mainly on algorithmic and research activities, but also dealt with project partners and customers. This image represents a selection of some technologies I studied, mastered, and applied to real world problems during the years. More details in the complete curriculum vitae. A detailed list of my publications, including all pre-2012 ones, is available in the complete curriculum vitae. Apart from many presentations at international scientific conferences, I also appeared on traditional media at local, national, and international level: newspapers, radio, tv, magazines. In almost all cases, it had to do with dissemination activities for Marmota project. More details in the complete curriculum vitae.